GOweekly had the following article. If you know about the Chichi dolls, founded by Serena Janet Israel, a professional mold maker, you are aware of their beautiful colors and the many activities that they portray. Marjan Hegen, a tourist from the Netherlands who came to visit Curaçao, stumbled upon the Chichi store and their website and joined one of the workshops. Without hesitation she contacted Serena again with a goal. Marjan’s goal was not to simply have a Chichi sitting in a wheelchair, but her point was, why not? There are Chichis that are walking, sitting, standing, but why aren’t there Chichis in wheelchairs? Serena was confronted with this matter that she never thought about when making her Chichis. 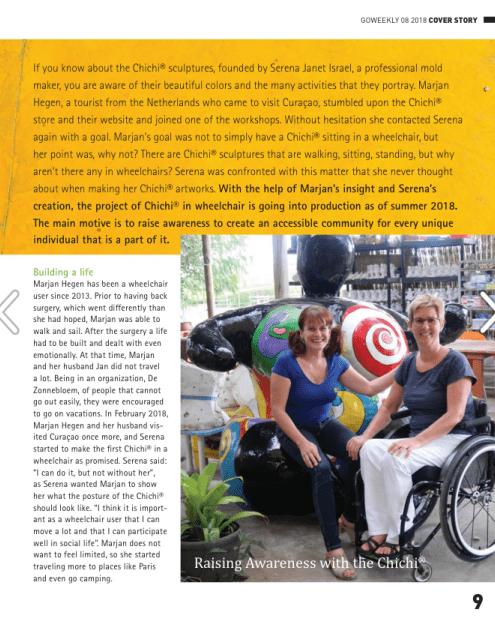 With the help of Marjan’s insight, Serena started the project of making Chichi dolls in wheelchairs to raise awareness to create an accessible community for every unique individual that is a part of it. 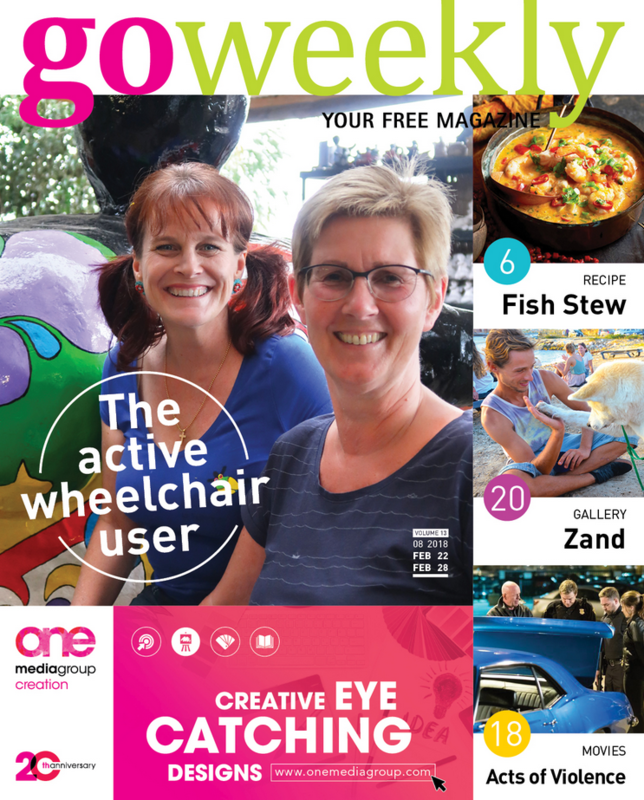 Marjan Hegen has been a wheelchair user since 2013. Prior to having back surgery, which went differently than she had hoped, Marjan was able to walk and sail. After the surgery a life had to be built and dealt with even emotionally. At that time,Marjan and her husband Jan did not travel a lot. Being in an organization, De Zonnebloem, of people that cannot go out easily, they were encouraged to go on vacations. 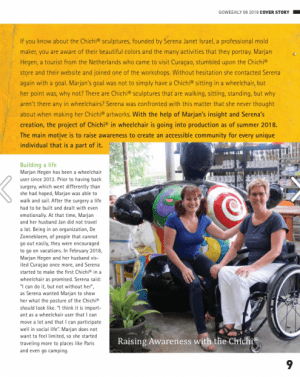 In February 2018, Marjan Hegen and her husband visited Curaçao once more, and Serena started to make the Chichi in a wheelchair as promised. Serena said: “I can do it, but not without her”, as Serena wanted Marjan to show her what the Chichi’s posture should look like.“I think it is important as a wheelchair user that I can move a lot and that I can participate well in social life”. Marjan does not want to feel limited, so she started traveling more to places like Paris and even go camping. In order to fully participate in our society, it is important to have accessibility for people with disability and medical care, “but also an active attitude of wheelchair users is required. You also have a responsibility to move and become active” says Marjan. When Marjan is home in the Netherlands she is more independent and can easily go groceries shopping by simply attaching her hand bike to her wheelchair, but it is in fact difficult to do so here in Curaçao.“It is important that people have comprehension of fellowmen withdisability, but also that the environment is well adjusted; pavement with ramps, buildings that are accessible and have adjusted toilets”. Facilities should be accessible and wheelchair friendly to benefit everyone that is a part of our diverse community. 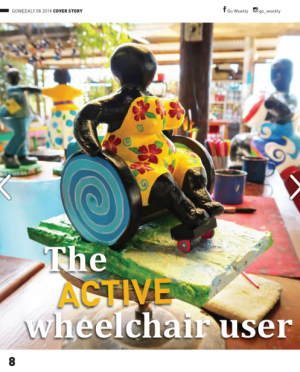 Raising awareness of enabling access for people with disability is what is being done with the Chichi doll in a wheelchair.Even the surface on which the chichi doll is placed symbolizes the process that Curaçao and the world as a whole should undergo; the process of moving from inaccessibility to accessibility. This is symbolized by how the Chichi doll leaves the part of the surface that is grass and gravel and rolling on a beautiful street that is accessible and wheelchair friendly. After Marjan’s surgery her life changed completely.It was a journey towards creating a totally different attitude towards life. 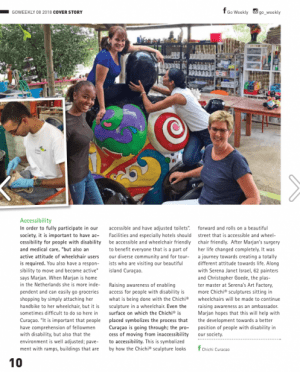 Along with Serena Janet Israel, 62 painters and Christopher Goede, the plaster master at Serena’s Art Factory, more Chichis sitting in wheelchairs will be made to continue raising awareness. Marjan hopes that this will help with the development towards a better position of people with disability in our society.